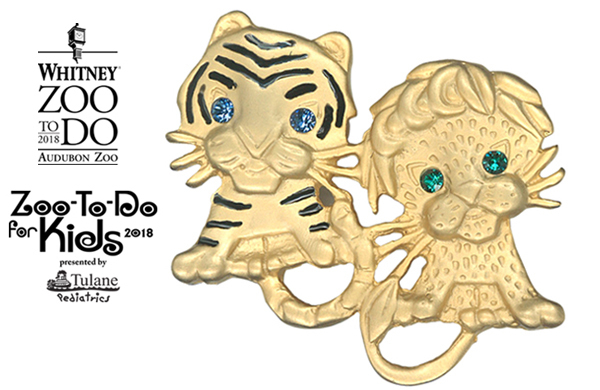 Purchase a limited-edition Zoo-To-Do Tricentennial pin designed by Adler’s exclusively for the 2018 Zoo-To-Do events! The pins are $95* each and all proceeds support Audubon Zoo. Only 300 pins are available, so purchase yours before they sell out. The pin’s design is rich with symbolism saluting Zoo-To-Do’s beginnings and how far it has come. The white tiger represents the first themed Zoo-To-Do, which celebrated the Zoo’s Asian Domain. The lion represents the 2018 theme with the three crescents in its mane representing New Orleans’ tricentennial. And, the cats are shown as kittens in honor of Kitty Duncan, Chair of the first-ever Zoo-To-Do in 1972. Pins are gold-tone and approximately two inches square. Please contact Audubon Marketplace at (504) 861-6171 and ask to speak with a supervisor.